Rare Earth Metals – Will they limit the attractiveness of electric and hybrid cars? I’ve been predicting for a while now that greater adoption of cars that utilize lithium batteries will cause a huge rise in demand of the metal causing increasing costs of batteries, rather than decreasing costs as is required for mass adoption of electric and hybrid cars. It seems this is already happening and being accelerated by tariffs and trade limitations in China where most of these metals are mined. In addition to lithium, the price of neodymium – a rare earth metal that is key to the efficient permanent magnet motors in electric and hybrid cars – has quadrupled in the last year. The Wall Street Journal has an article on this story today. I have not seen much speculation as to the motives behind China’s protectionist moves. Given the rising prominence of their automotive manufacturing industry, perhaps they see this as a way to become the only country with the ability to make affordable electric cars. Or maybe they are just being opportunistic and exploiting their position as the only source of a material used in a growing market to make more money. Toyota claims to be close to having an induction motor that will be able to replace permanent magnet motors in these applications. If true, this would be a huge technology breakthrough. This has been a research goal of many a scientist over the years, so it is surprising that Toyota could have come up with a solution in such short order, but they are also a company that does not tend to exaggerate their technology accomplishments so I’m looking forward to seeing what they have done. Needless to say, rising costs is the last thing hybrid and electric cars need to start taking a more meaningful share of the global auto market. But you never know, maybe this will spur more innovative thinking leading to a completely different battery technology that is an order of magnitude better than lithium. Increasing CAFE standards are the primary tool the government uses to force automakers to increase the fuel efficiency of their vehicles in the United States, and in general I think the population believes that getting more mileage out of their car is a good thing, as long as the car is affordable, and performs comparably to what they are used to. We are not ready to accept the range limitations of all-electric vehicles priced within reach of the middle class nor cars with tiny engines that accelerate from 0-60 in 12 seconds. If we simply replaced the gasoline engines we use today with diesel engines and make no other changes, we would see an instant increase in mileage. For instance the gasoline BMW 335i gets 28mpg highway and the diesel gets 36mpg. That is not likely to happen overnight in today’s environment. Diesel engines are starting to build a fan-base in North America with enthusiasts who have realized that they have much better fuel economy than their gasoline powered counterparts and can be a lot of fun to drive given their superior torque. But automotive diesel engines have significant hurdles to leap before they reach mass acceptance because the cost of the engine is higher, and in America, the cost of the fuel is higher, thus negating the fuel efficiency benefit. In Europe, diesel is cheaper than gas, causing diesel cars to be much more popular than gas and this contributes greatly to the high mileage enjoyed by the European fleet. 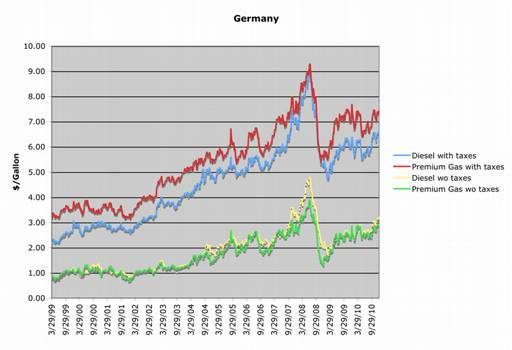 So why is there such a price disparity of diesel vs. gas in the US and Europe? It’s simple, in Europe, the taxes on diesel are lower than the taxes on gasoline. 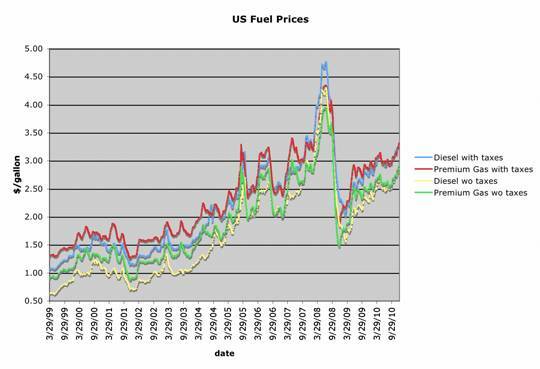 It can be difficult to see here because US fuel taxes are relatively low causing the lines to overlap a lot, but US gas and diesel prices retain their relative positions before and after taxes. So would it not be much easier to increase the efficiency of the American fleet simply by creating a fuel tax policy encouraging the purchase of significantly more efficient diesel engines? Part of the difficulty of this is that federal taxes are only a portion of the taxes on gasoline and doing this effectively would require cooperation between Washington and the states.